United have been given the green light to sign Chelsea winger Willian after the winger informed the Blues of his decision to leave the club this summer. With barely two weeks left in the transfer window, Chelsea have reportedly decided to sell the player for £70 million. Barcelona are also interested in the 29-year-old winger and have seen two bids rejected by the London club. It is believed that Willian has set his heart on a move to Manchester United and Spanish Outlet Mundo Deportivo claims that United are in pole position to land the Brazilian international. Mourinho has been linked with several right-wingers this summer which includes Welsh Star Gareth Bale and Croat Ivan Perisic but the Willian deal looks most likely to happen as United look to strengthen their squad ahead of the season. The transfer fee of £70 million is inflated, but that is the price clubs pay these days for top performers and United will have to stump out the cash to secure the transfer of the pacy forward. Mourinho has used several players in the right wing with Martial, Rashford and Mata playing the role last season without fully convincing the United faithful. Willian is a natural right winger and would fit perfectly either as a midfield four or a three-man attack favoured by Mourinho. 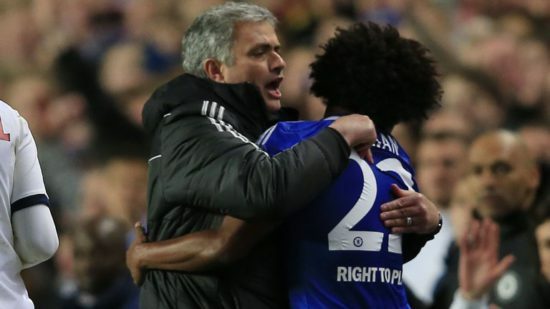 Willian worked with Mourinho at Chelsea with the duo winning the Premier League and Carling cup in the 2014/2015 season.